As a long-established supplier of Advanced Ethernet Demarcation Devices, Metrodata's MetroCONNECT family is used by Carriers globally as Managed Customer Premises Equipment. The range supports extensive features for multi-service multiplexing, traffic Prioritisation & Policing, Circuit Activation Testing and In-service performance monitoring, for today's exacting customer applications. We're rightly proud of the cost-effectiveness of our MetroCONNECT solutions for Ethernet services of up to 10Gbps, which use our custom 'MetroSAM' (Service Assurance Module) hardware for wire-speed test traffic generation, loop-back and detailed traffic analysis. 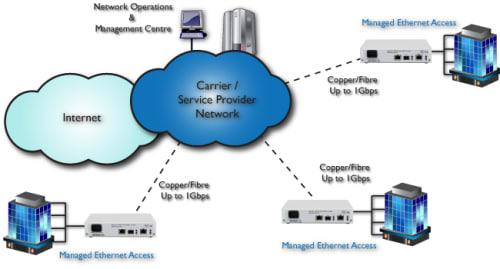 Nevertheless, we have seen market demnd for a fully Manageable product, featuring Copper-Copper or Copper-Fibre Ethernet connectivity, at up to 1Gbps, with a reduced feature-set, at a new market-leading price point. We're pleased to announce the introduction of our FCM5000 Managed Ethernet Connectivity product. As a flexible Managed Ethernet Media Converter, the FCM5000 supports configuration and management via local Terminal, Telnet/SSH, Web Browser and SNMP. The product also has a number of attributes, including 'dying gasp' power-fail alarming and VLAN support, traffic prioritization and differential service bandwidth limitation, allowing very effective use as an entry-level Carrier demarcation device. Click to view more information on the FCM5000, or contact us for pricing details.